Everyone likes to say “We Want Bama” until they actually have to face Alabama Crimson Tide, but the Clemson Tigers mean it. Unlike most of College Football, Clemson has taken the best shots Alabama had to offer—and almost won. But that was in last year’s national championship game. 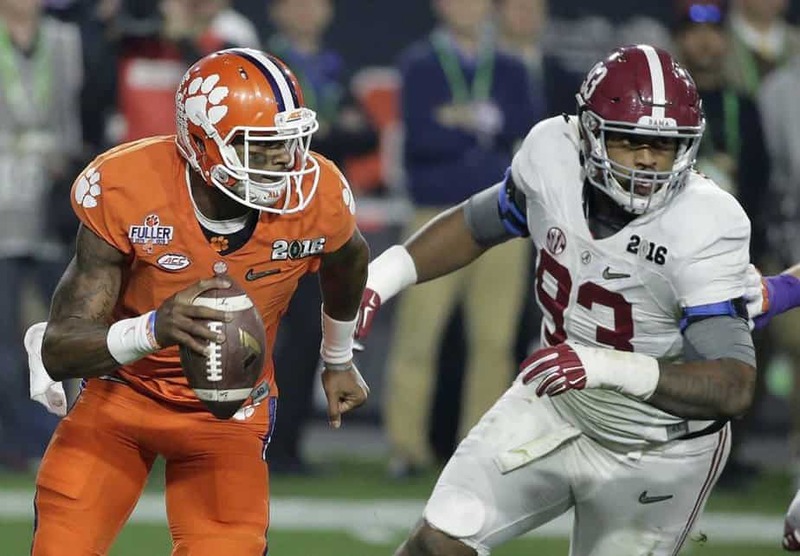 This year, the Clemson Tigers believe they are the better team. They feel they have what it takes to knock the mighty Crimson Tide off their perch on top of the college football world. So—do they? Yes and no. Clemson was an offensive machine last season, and while how they generate their offense has changed a little, the outcome is almost the same. Last season they were the No. 11 offense (total yards) in the country, but this year they have averaged about 10 yards less a game (so they are No. 12). But where it matters most—in points—they are doing a little better this year (38.5 points/game last season; 39.5 points/game this season). Last year’s offense was a bit more balanced, but this year the team has been passing more and running less—especially quarterback Deshaun Watson. He had over 200 carries for 1107 yards last season; this year he’s only had 144 for 586 yards. Much like the offense, the defense hasn’t changed drastically either. The Tigers are still a top 10 defense (No. 8) with a tough run defense (No. 19; 123.1 yards/game) and pass defense (No. 17; 183.8 yards/game). The biggest change is in scoring. Last year they allowed 21 points/game; this year it has been closer to 17 points. But if the team is producing to almost the same degree as last year, how can they be expected to do better this time and win? By all indicators, Clemson should look almost the same and produce a similar result. So then how come ESPN’s Power Index gives Clemson a 39.6 percent chance to win? Should it be lower? Not at all. If anything, they deserve a little more credit than they’ve been given. Not so much because they are so much better than they were last season, but because Alabama is not as good as they were—and the Crimson Tide decided to switch offensive coordinators after beating Washington, 24-6. As the story goes, Lane Kiffin walking away now rather than after next Monday’s game was a mutual decision between Kiffin and Nick Saban—but few believe that story to be true. Not only was Alabama’s play-calling was questionable, to say the least against Washington, but there have been rumors about drama inside the program involving Kiffin. 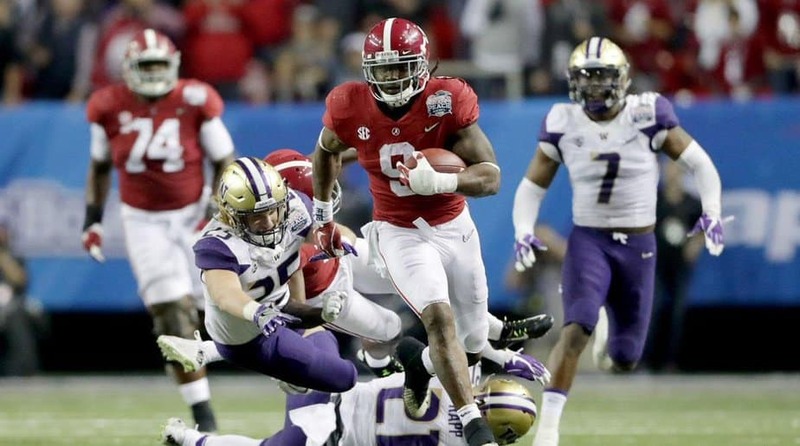 For some reason, even though Bo Scarbrough was gashing the Huskies defense with ease (9.5 yards a carry) he only saw the ball 19 times (and still gained 180 yards and scored two touchdowns). Even though Jalen Hurts was finally playing like a freshman is expected to play, Kiffin kept going back to the pass (Hurts was 7-14 for 57 yards). The play calling appeared to be watered down, to say the least. So rather than risk that happens in the title game, Kiffin is out, and former USC head coach and offensive analysts Steve Sarkisian will be taking over. Will that cause any issues? You would think so, but Saban is confident the offense will be fine. “It’s been our goal as a program to always give our players the best opportunity to be successful, whether it’s personally, academically or athletically,” Saban told the media. It would be naïve to think changing offensive coordinators at this stage is not going to have some effect, especially when the guy filling in hasn’t coached in over a year and was fired from his last job because of drinking issues. But the offense is the least of Alabama’s concerns. As long as Sarkisian has Hurts hand the ball to whoever happens to have the hot hand at least 20 times, Alabama’s offense will be just fine. The issue, however, will be with the defense (sort of). If Alabama has a weakness, it would have to be there pass defense. On paper, it appears as if Alabama has one of the best units in the country (No. 14; 182 yards/game). But there have been teams this season that have enjoyed great success throwing on the Crimson Tide (Arkansas and Ole Miss had 400+ yards passing). Clemson’s passing attack is better than either of those, so it is not hard to see the Tigers throwing deep early and often. However, where this will pose a problem for Clemson is Deshaun Watson’s tendency to throw interceptions. He has 17 this season and 30 over the last two. Alabama has made causing turnovers and scoring points off them a habit this season. 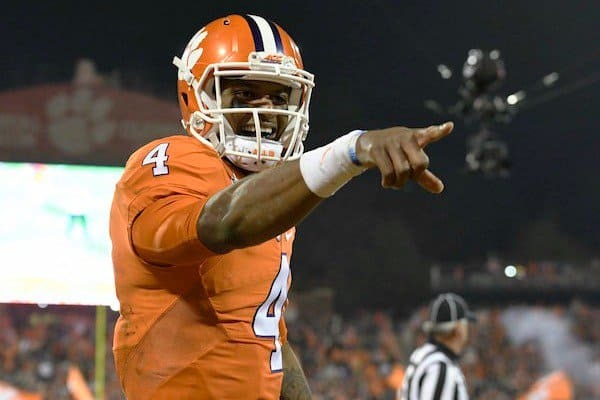 Clemson will not have much if any success in the running game so they will have to lean on their best player, Deshaun Watson, to win it for them with his arm. However, it would not be shocking if he were to win the game with his arm—but for the other team.